According to me, the 75th Golden Globe Awards is the blackest award ceremony of all time, as also depicted by the official poster seen above. The celebrities that attended the event dressed in black from head to toe. To start 2018 with black as if it's going to be the new trend of the year seems dull, but actually there is a reason for this special dress code. The Hollywood sexual harassment scandal from last year has pushed the anger of the public to the extreme and once again raised the public’s concern and interest for women’s rights. 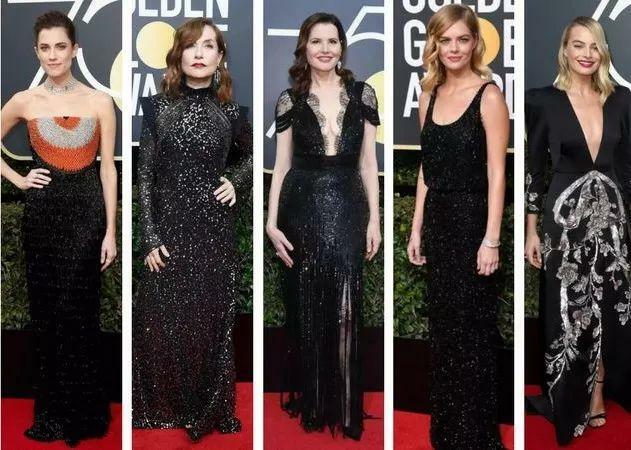 In response to #Metoo and Time’s up along with other anti-harassment/ anti-aggression campaigns, the Golden Globe presented many stars in black gowns and invited eight prominent social activists who advocated gender equality along with the actresses to join the 75th Golden Globe award. Black is an attitude. As Yohji Yamamoto said, black is modest and arrogant at the same time. Black is lazy and easy but mysterious. But above all black says this: “I don't bother you- don't bother me. Although life is not a walk in the red carpet, we still need attitude and quality to make it worth living”. Even without the exuberant colors of dresses at the red carpet as in the previous years, this year’s award ceremony is still a feast of fashion. Now, let’s glance through some best outfits on the red carpet. The Oscar-winner Meryl Streep (left) wore a black off the shoulder tuxedo-inspired gown from Vera Wang Collection. The gown is strikingly similar to the black gown from Valentino Collection Streep wore in "The Devil Wears Prada". 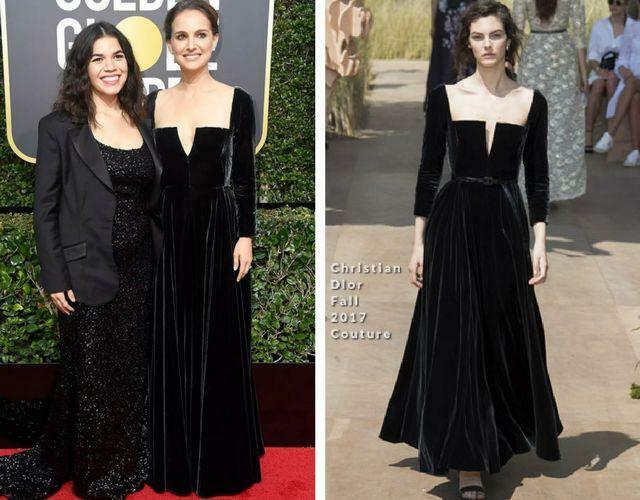 Rachel Brosnahan, the star from the comedy television series "The Marvelous Mrs. Maisel", wore a Vionnet Spring 2018 black gown which marries a classic silhouette with subtle modern details. Jessica Chastain’s gown compliment her fabulous figure to perfection. She wore black to take part in the #TimesUp movement, promoting equality for women. The shimmering silver color in the back is popping and form a great contrast with the gown. Natalie Portman, also wore black in solidarity with the #Timesup movement. Portman’s floor-length Dior gown with a striking geometric neckline, and her ‘effortless updo’ hairstyle bring out the best of each other. Dakota Johnson stepped into the Awards in a stunning Gucci gown with a flowing train. Her gigantic Silver Star embellishment on her back could only be seen when she turned around, which can be considered a delightful surprise. Some stars opted to wear gowns that had glitters on their gowns to add a little more vibrant element into the designs. Actress Margot Robbie wore a long-sleeved black satin Gucci gown that featured a plunging, featuring a crystal bow and 3-D floral embellishments. Allison Williams was in an Armani Privé Spring 2017 gown. It drew the attention upwards thanks to the orange semi-circular design on the bodice. Nicole Kidman made a powerful statement in a delicate dark gown that featured a high neckline with an open back. She looked stunning from every angle. Angelina Jolie was wearing a long gown. The sheer, see-through top was accentuated with feathers at the sleeves, almost giving a mythical feel to her outfit. I personally think Angelina Jolie nailed the look. Wonder woman star Gal Gadot arriving at The Golden Globe Award 2018 wearing Tom Ford cropped blazer with satin lapels mannish twist to her strapless sheath gown.